Sithean is a delightful new house situated on a working hill farm in the stunningly beautiful Glen Lonan. Sithean, (pronounced shian), means 'fairy knoll' in Gaelic and is built in an elevated position overlooking Glen Lonan. The house commands spectacular views of Loch Etive and the 'Shepherds of Glencoe' to the North, Ben Cruachan to the East, and the sun sets over the distant hills of Morvern.The house is beautifully designed and is full of surprises like the sauna which accesses into the birch woodlands. It sleeps eight and our goal has been to make it as family-friendly, comfortable and unique as possible. We had a lovely time at Sithean - the views around the cottage are stunning. It is very safe for young children. It is a great place to relax and enjoy the peace. Taynuilt is a pretty village with good shops - the Church of the Visitation is worth a visit. Oban is not far away and is a nice day trip. We thoroughly enjoyed our time at Sithean. A lovely comfortable house in a peaceful location with wonderful views. We have just had a wonderful week in this lovely comfortable house. Arriving to find it warm with a welcome of fresh scones, butter and jam also milk, fresh coffee, tea etc etc. The house is spacious but still has a cosy feel, with easy to control heating and an excellent wood burner. There are many places to sit and relax inside and out. The owners, Leonie and Martin are lovely, very friendly, and went out of their way to help make our 25th wedding anniversary memorable.They helped with the delivery of flowers and providing details of a local piper to play as a surprise for my wife. The location is superb, so peaceful with plenty of wildlife. We were blessed with good weather so were able to walk to the village of Taynuilt (just over 2 miles away) an easy going walk, all along the road, taking the lovely train journeys to both Tyndrum and Oban. Also just a short walk to Angus garden, a lovely stroll to chill out. There are lots of things to do in the area within a short drive so it's a good base if you plan to drive each day. We would love to return again in the future. Perfectly designed accommodation in spectacular settings. The owners have gone to great effort to ensure every comfort is provided for. Our family enjoyed a fantastic week here. We loved the marked trail across the land, the well proportioned space and the luxury of your own sauna. The owners helped with all our enquiries, this place is highly recommended. This is our 3 rd trip to Sithean.... again it was really lovely. The house.... the location ... the scenery..... just perfect..and the dog loves it too. This is our 2nd visit to Sithean and much like our first, it didn't disappoint. The house is beautiful and spacious, the grounds are vast and scenic. It is just wonderful and as well as all that, the hospitality received from the owners is second to none. There were freshly laundered towels on each of the beds, fresh linen and even scones with butter and jam ready for our arrival! We love it here and hope to return again very soon! This is the second time that we have stayed at Sithean. The group of 8 of us absolutely loved our time there so much we had to go back and so have agreed to make it an annual trip. The location is perfect for walks (if the scottish weather is nice to you) or for a relaxing time by the fire. There is great facilities and a feeling of being at home the moment you walk through the door. Cant wait for next year! Lovely few days at Sithean. Very comfortable house in a beautiful location. They’ve thought of everything and it forms a perfect base to explore this beautiful part of Scotland. This was our second stay at Sithean and although short it was just perfect. The house is fabulous with everything you need and lots of added extras not often found in a self catering holiday home. The beds are comfortable with quality linen and fluffy towels. The surrounding area is peaceful and scenic. Leonie is extremely helpful and very accommodating. Def return for another short get away break. A lovely treat for my 60th Birthday. Terrific, quiet location with fabulous views. The property is spacious and so well equipped. The beds and furniture comfortable. Eco friendly products available and we were delighted to be able to recycle our waste as provision was made and disposal easy. A car is a must to get to places such as Oban and it's eateries. We were lucky with the weather and didn't have to use the car for our many dog walks. No easy place to let the dog off the lead although the beach at Oban allows dogs. We didn't get a proper chance to meet the owners but were aware of them coming and going and they left home-made scones and jam for our arrival! We had stayed near in Dalavich near Taynuilt 17 years ago and decided to return with our teenagers and dog. Came across Sithean by chance on an internet search and so glad we did. On arrival we were met by the lovely owners who delivered fresh baked homemade scones, butter & jam which were absolutely delicious. The accommodation was spacious and with all the necessities required home from home (including wifi for the teens!) The views and wildlife were stunning. Plenty of good hilly walks which gave the legs a good workout. Local shop and tea rooms a 45 minute walk or less than 10 in the car. Good base for exploring the area including Oban, Isle of Seil and worth a drive to Fort William 1 1/2 hr away. Coming back after a day exploring and relaxing either indoors or out depending on the weather taking in the magnificent surroundings made for a very enjoyable stay. Sithean is placed in a tranquil and beautiful environment. Expect lots of birds and even a red squirel on the feeders.The house itself is charming with a lovely walk right from the doorstep up the hills to a magnificent view. We really enjoyed staying here. A few tips for future guests and Leonie and Martin: our family is quite tall and the beds were very short; The picnick table really needs repair; The dogs spend time om the sofa cushions outside, therefore we didn't use them. Some pans need replacement and are quite small for a group of seven. But, as said, we enjoyed every minute of our stay at Sithean and would recommend the house to nature lovers. hope to be back sometime soon. When we arrived at Sithean we were awestruck by the beautiful setting this amazing house is built in and immediately felt at home (the fresh scones and cupcakes that awaited us on entering the kitchen multiplied that feeling). The place is very spacious and beautifully decorated, has all the facilities you need for a great self catering holiday and is surrounded by beautiful hills and farmland. We loved every second of our holiday there and wished we'd have had more time to stay there (we're definitely planning to go back!). Big thank you to Leonie & Martin who made us feel at home and welcome on their land, provided us with great tips for things to do in the area and always responded instantly to our queries. This is my second visit to Sithean and hopefully not the last. The cottage is beautiful and very well maintained. It is situated in peaceful surrounding where all you see are trees and beautiful countryside and all you hear are birds and sheep. We were visited by squirrels and chickens and best of all ponies. Leonie and Martin are always at hand if you need anything. This is a place where you can lie back and forget the world. Our third visit here and as enjoyable as ever. We particularly enjoyed the new garden furniture. The grandchildren enjoyed the Fairy Knoll decking area & meeting the farm animals. Lovely house in a beautiful area. Perfectly located for feeling completely isolated, yet accessible to amenities, attractions and the beautiful scenic landscape of the region. Lovely hosts, who are clearly passionate about the environment in which they work and live. A well-equipped cottage that is designed and built to be part of nature, while providing comfort and a relaxing escape. Ideal for family groups of up to 8. We had a brilliant weekend stay at the end of March. The house is beautiful, had everything we needed and fitted 7 adults easily. The log fire was ideal after our walk in the rain which was a trail we could follow from the house. The owner was very quick at replying to messages and was only a text away if we needed anything. The scones were lovely too! We all loved our stay and will be back. Thank you! What a wonderful place to spend Christmas what a lovely bright cottage so warm and welcoming thanks. From the freshly made scones which greeted us on our arrival to the cosy, clean rooms, this is a great place to stay with wonderful walks and cycle rides on your doorstep. We enjoyed cycling in to Oban along the quiet back road and indulging in a sauna after a day climbing the Cruachan munros. Friendly and helpful service from owners Leonie and Martin. Would love to return again soon for a longer stay. This was our second time at Sithean. I love that the cottage is so well equipped and is such a cosy, relaxing place to chill. We brought our two dogs along and they absolutely loved it. You can walk for miles and explore the surroundings in such a quiet part of Scotland. We will definitely be back in the future. We returned for a 2nd visit to Sithean and we weren't disappointed. A warm welcome awaited us with scones, butter and jam. Lodge was just as good as we remembered with the addition of WIFI which we appreciated. Warm, comfortable and clean with all the mod cons you would expect. Weather was fairly typical but the log burner made up for it with an endless supply of logs included. We didn't use the sauna this time but could have. Enjoyed long walks in the local area and the convenience of Oban on the doorstep. Hosts very helpful and approachable. Enjoyed watching the sheep and wildlife around the lodge and the very cute sheep dog pup. Hope to return. A great escape - peaceful and stunning. Amazing location with beautiful views of the surrounding mountains. A very modern , comfortable house with great extras such as a sauna , outside seating area and a picnic table on a viewing platform. Friendly and helpful hosts in nearby property. location is excellent, property is is very good for 6 people, Leonnie & Martin provided excellent back up when needed. We would all come back again providing that there is seperation between the bounderies of Sithian and the farm working dogs. This is something that we have discussed with the above and they have agreed to implement our suggestion. Once implemented we would be happy to recommend this property to others. We are hoping to return. We had a wonderful time in the cosy, remoteness that is Sithean Self Catering. Leonie was very helpful and we loved the freshly made scones that were left for us. The house is comfortable, clean and well designed with a great wood-burning stove which we favoured over the central heating (coming up from Edinburgh being able to make a proper fire is a great novelty!). The surrounding area was lush and green (July) and the scenic drive through Glen Lonan below the house to Oban comes highly recommended. It can be hard to choose between all the fantastic things to do in the area - and it was good knowing we could always retreat back to Sithean, our own little piece of the Highlands. Awesome stay away from city craziness! What an amazing house on a working farm in beautiful country setting! Exactly what we needed! We adults made great use of the sauna, bathtub and porch, while my teenagers enjoyed wifi access and their own rooms away from the parents! Kitchen was very well equipped for cooking, and Oban was a short drive to access Iona, Staffa and the other islands. We will come back on our next Scotland adventure (from Texas!) And many thanks to Martin for the extra gift of working some cattle! We booked short stay for a few days during June 2017 after seeing it on the web. The pictures didn't do it justice! We'd researched the options for accommodation thoroughly and also checked out the reviews - many people had returned time and again to enjoy the experience, and we can understand why. Whilst the weather was ok (we had a couple of dull days and one very wet day), the location and cottage more than made up for this. We had planned to have a barbecue if the weather held - however we were unable to find the BBQ grill. Leonie ensured that we received a brand new grill on the same day - it was waiting for us on our return. From the first to the last day, both Leonie and Martin were the perfect hosts, ensuring that our time at this beautiful place was as trouble free as possible. On arrival, we were greeted very warmly by Leonie, who also gave us fresh eggs which had been collected that day. This along with the home made scones (delicious! ), made our arrival seem something special. We've often stayed near the area but have seldom had an opportunity to explore properly. We found that the few days we had at Sithean were not enough for us to make the most of our visit - which will prompt another trip very soon! Thank you Leonie and Martin, you made our short stay with you incredibly pleasant and we look forward to seeing you again!. A beautifully designed home, peaceful and relaxing in a lovely setting.. watching Woodpecker whilst eating breakfast..!! !wonderful warm welcome homemade scones and fresh eggs.. will most certainly be going back there.. one would never be disappointed with their visit.!!! Just spent a wonderful two weeks at Sithean and wish it could have been longer. We have been holidaying here since 2010 and are never disappointed. The house is so comfortable and perfect no matter what the weather (mixed for our fortnight with some beautiful days and some less so) and there is always something to do whether indoors or out. Martin and Leonie are perfect hosts with nothing ever too much trouble should you need any assistance and they have created the perfect holiday home in which to relax and leave all the hustle and bustle behind. They maintain the property to a high standard and this year have added some fantastic outdoor furniture which really complements the decking area and we used it on a daily basis. As ever the scenery was breathtaking and we particularly enjoyed a cruise on Loch Etive (a new venture from Etive Boat Trips) when the conditions were perfect and the seals were basking on the rocks! Can't wait for our next visit in November! From the first moment we walked into the Cottage we felt instantly at home. Well equipped kitchen, spacious and comfortable living and dining area with an efficient log burning stove with lots of wood to burn. Big bay windows give the feeling that one is part with the surrounding nature. Very comfortable beds too. Outside space has sheltered spots where one can still enjoy the fresh air even though its rainy or windy. Very well located as a stop for a night or 2 on the way further north. Only a 15 minute drive to Oban. Leonie is a great landlady! Her scones are delicious and the fresh eggs she gave us were well appreciated. We are lucky to have picked on Sithean Cottage. We only had a short break here but it was the perfect place for a family weekend away. Amazing house, very comfortable with stunning views. Very well equipped kitchen and even stair gates to keep our little ones safely contained. Only a short drive into Oban where there is so much to do! The hosts even provided freshly laid eggs for us and were very helpful and friendly to deal with. We will definitely be returning and would highly recommend to anyone wanting a relaxing retreat in the country. We were 6 old university friends celebrating some significant birthdays. Sithean was perfect... great location and warm and comfortable. We didn't want to leave and hope to be back sometime. Superb location, close enough to all that you need but with a lovely feel of isolation. Spacious and modern accommodation - very Eco-friendly too. We loved our stay at Sithean in the beautiful Glen Lonan, the house was pristine and had everything we needed. Adored the fresh scones and jam on arrival, and fresh eggs during the week. Despite a lot of cold wind and rain, we were cosy and warm at Sithean. We loved watching all the garden birds feed and waking up to sheep right outside the window :) Thanks for a very relaxing week. A wonderful house with amazing surroundings. Peaceful and a great location. Property had all home comforts and was well equipped. Beds were very comfortable. We had a fantastic week at Sithean. The house is unique and gives lovely views of the beautiful countryside all around while inside you are cosy and warm. There are walks which are easily accessible from your doorstep or if you want to go further afield a wide range of interesting places to visit. We will definitely go back. I always spend a long time choosing where to stay on holiday; it's not easy since the demands of a growing family shift and change every time we go away. I have learned from bitter experience that the accommodation has a real impact on the entire holiday. Sithean promises all mod cons, views, underfloor heating, a wood-burning stove, a conveniently close train station and local shop, and a sauna. Prior to our arrival I was a little anxious that I'd got my hopes too high and there was bound to be a snag of some kind. I needn't have worried. Martin and Leonie seem to have thought of everything when they created Sithean. It's a wonderful space to be – both inside and out – with all windows looking out into the trees or onto the hills or over the decking area where bird feeders draw all manner of local wildlife, including the beautiful sheep. Lovely property exceeded that our high expectations, spacious, comfortable and with everything you need for a week or more holiday. Sithean felt like a real home from home but with the added benefit of being located in such a wonderful spot with walks and runs a plenty right from the door. Lots of attention to detail has been paid to ensure you have a comfortable and welcoming stay - including some fabulous scones on our arrival! If you want a comfortable place to stay with great access to wonderful walks, fresh produce just a mile or so away in Taynuilt and Inverawe then I would highly recommend Sithean to you. We were attracted by the eco credentials of this property in the first place, and the web site did not lie. Indeed the photos of the house could hardly do it justice. We had atrocious weather when we were there for 2 weeks over Christmas and New year, but indeed quite the opposite - we felt no guilt in staying home and enjoying the welcoming warmth and tasteful decor and design of this wonderful house. The house had everything we needed, and more, and when I realised I'd forgotten a Christmas pudding, our hostess Leonie provided one! She and Martin certainly go the extra mile for you! The location was excellent for us, with lovely walks and cycle rides from ourside the door, as well as near by, and super kayaking on Loch Etive. We're pretty certain we'll be back - providing this excellent place is not completely booked up by all our friends who either came to share it with us, or are getting rave reviews from those who did! Thanks Martin and Leonie, and thanks to your architect! Lovely house which is very cosy and homeley the stove and sauna were my favourite things about it. The owners were very friendly and helpful. Would definitely stay here again and recommend this place. Beautiful property with plenty of space for two small families. Plenty of local friendly wildlife from birds to cows and ponies. We loved the hill top picnic table and even managed an October barbecue. Quiet and secluded, but local facilities easily accessible. Hope to visit again before long! Just returned from great weekend at Sithean. Was great excuse to relax - with no men or children and do lots writing. The cottage was immaculate, cosy and we were welcomed with jam n scones. It always a pleasure to stay here because its so well supplied with the little things that make all the difference - salt n pepper, dishwasher tabs etc. I slept too well in the lovely comfy beds. Cant recommend this cottage highly enough. Leonie is so welcoming and kind - fresh eggs for breakkie. Great stay at Sitheans, total freedom ! The farm is close by but never the less you stay in an quit surrounding. Friendly people and nature all around. House is fully equipped and spacious for our group of 6. We enjoyed staying weer and hopefully return some day. Thx for a great stay in the western highlands ! A delightful house in a beautiful area. This was our second holiday in Sithean. The house is situated in a beautiful, peaceful area with access to Taynuilt for provisions and a very good restaurant at the Taynuilt Hotel. There were 8 of us on the first visit and 4 on the second and the spacious, well equipped house provided ample accommodation for both party sizes, in living and sleeping areas. 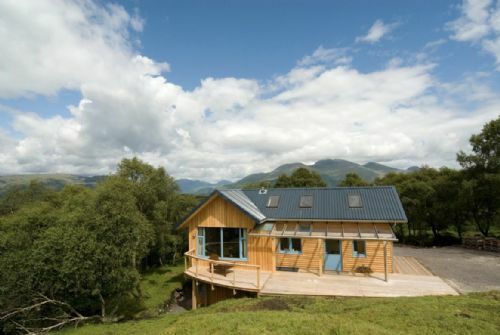 The new decking structure offers stunning views of the surrounding countryside and Ben Cruachan to the east. Quite exceptional value, we hope to return. An excellent family retreat in the middle of the beautiful Scottish countryside. We were surrounded by beautiful woodland and mountains, not to mention the local livestock which the kids found fascinating. Although a little off the beaten track the house is well serviced via the local amenities that can be found in the village. I would definitely recommend the Taynuilt hotel for dinner. Fantastic local produce prepared to a very high standard and a great wine list to accompany the food !! First we saw this house, we believed we found a paradise. Thanks to Leonie and Martin for their warm welcome, the homebake scones and marmelade ! Als wir dieses Haus das erste Mal sahen, dachten wir wirklich, das wäre das Paradies. Jeden Tag besuchten uns die Kühe, Schafe und Hühner, rundherum einfach Natur- herrlich ! Wir danken Leonie und Martin für Ihre Herzlichkeit, die hausgemachten scones mit Marmelade ! Our second stay at Sithean, and just as delightful as the first. The house itself lends itself to relaxation and play, with plenty of comfortable space and plenty to keep everyone occupied when the (inevitable) rain appears. As for the area, what with day trips to Oban, fishing on Loch Etive, beach barbeques and bike riding, we all had the most lovely time. We all loved Sithean, the house was lovely in a really beautiful location. It felt wonderfully remote and peaceful although only a couple of miles from the main road. We took great walks from the front door and were able to tour to many places although actually the temptation to just chill in the house was not resisted! We would certainly recommend to everyone. Some of our party arrived by train from Glasgow and found the journey extraordinarily beautiful. Leonie and Martin were charming and welcoming hosts, thanks for a great stay. Stayed in Sithean a few times this year for 2 or 3 nights on each occasion. Great place to stay, and I have no hesitation in recommending it as a place to recharge and enjoy a spectacular part of the world. We have been holidaying at Sithean since 2010 and intend to continue doing so as often as we can! As a family we have stayed in many self-catering establishments here in Scotland and elsewhere in the UK and abroad and we have never enjoyed a higher standard. Sithean is head and shoulders above the rest! The minute we arrive our holiday begins and we feel at home. The house is very well designed with plenty of space whether you are a party of two or more and has the added bonus of being suitable for wheelchair users. It is beautifully presented and, as part of its ongoing upkeep, has recently been redecorated and has new mattresses on several of the beds. We have stayed in holiday homes where refurbishment is clearly not a priority and the experience is not pleasant, so to see Sithean being maintained like this is wonderful. Having stayed during all seasons of the year, the house never disappoints - cosy with the wood burner in the winter and cool at the height of summer (and yes, we have enjoyed soaring temperatures at Sithean, most recently during our visit these last two weeks!). The outdoor facilities are great with the excellent treetop decking our favourite spot as the sun goes down over the yardarm! The views of Ben Cruachan and up Loch Etive and Glen Etive are spectacular in all seasons. Sithean is a working farm and this is never a problem - the sheep (beautiful lambs this year), cows, horses and chickens always captured the attention of the children and the bird feeders (bird feed generously provided) are perfect for observing the antics of the many visitors to them - over the years we have regularly seen chaffinches, siskins, robins, collared doves, red polls and woodpeckers (tree creepers and cuckoos if you are lucky). The surrounding area has countless opportunities for taking trips to nearby Angus' Garden and forest walks and further afield to the outlying islands. Sithean is a destination which you can really make work for you whether you enjoy relaxing onsite or being out and about - the choice is yours and we highly recommend it. Over the years we have rented many houses, and Sithean is up there with the best. The house fits the landscape perfectly, has bags of character and every window is a different picture! The vaulted open plan kitchen/dining/lounge area is a great social space. Its warm, draft free, has plenty of hot water, beds are comfortable, bathroom & shower room well designed - the sauna is a nice bonus, and its not often you can walk outside to an extremely private deck to cool down! Everyone loved the picnic bench on top of the knoll - inspiration indeed! From the house door try an evening (slightly boggy) walk up to the bench high on the hillside for a stunning view. We had a wonderful Time at Sithean and wish we could have stayed more ! Ideal location, great landscapes, comfortable house and perfect hosts, we would attend nothing more ! Even horses for our children ! Thank you for letting us stay at your lovely house in the treetops!Warm,bright,clean and comfortable-we loved it!Our dog had a great time too ....sorry,chickens! I have used hostels, campsites, B&Bs, self-catering and hotels all over Scotland over the past 50 years. Sithean is by far the most attractive, the house and facilities are lovely, the atmosphere cosy and the surrounding countryside ....well everyone knows how beautiful that is! No reservations at all. We all loved our 4 day visit. Fab stay in heavenly location!!! Nothing I can say about sithean would ever truly do it justice...its a fab place in a fab location with fab owners!! Our 2 kids my dad and our dog loved it!! Sithean itself had great attention to detail,nothing was forgot about to make your stay comfortable including the delightful wood-burning stove had a fab few nights sitting round this with my family after out enjoying the beautiful surroundings...must see place if you want to relax in a comfortable setting and enjoy all the great outdoors. A long weekend away with the family,this place was beautiful and ideal for the eight of us. So clean and tidy. The weather had been brilliant so the log fire was even needed till later at night. Sithean as a house boasts character and individuality round every corner. A high spec finish based on eco credentials in the most stunning landscape! !